Creative software applications for development are on the rise. I mentioned a few such tools in earlier posts (here, here, and here), ranging from electronic health records to Web 2.0 social networking in post conflict situations, and even Google.org is extending its toolset (see also the recent Google.org blog post about it). The earlier mentioned tools operate at the destination and might seem ‘far’ away. Recently I stumbled upon the Kiva site through ISF, which brings one of such applications at your fingertips and lets you connect with those people ‘far’ away. Kiva is based on the micro-credit financing approach pioneered with the Grameen Bank and for which Grameen and its founder, Muhammad Yunus, received the Nobel Peace Prize in 2006. With Kiva, it is not a single bank in Bangladesh that lends to the local entrepreneurs, but an amalgamation of individuals, groups, and companies from across the world that—through the Kiva website—lend $25 at a time to people’s entrepreneurial projects presented on the website, and who then receive the actual money through ‘field representatives’, i.e., local micro-credit finance organizations (MFI) in the countries that Kiva collaborates with. That is: you choose how and where your money gets used, and, in almost all cases, have your investment paid back in full—and all that with a few mouse-clicks (see graphical explanation of the business process). In addition, you don’t put all your eggs into one basket, but pool together with other lenders to reach the requested funds; put differently: the risk of not seeing back the full amount of your investments is spread out over the whole group of lenders to the chosen project. Further, the lender lends without interest (and I sure hope the local MFI do have none or a low interest rates), and the financial ‘return on investment’ can vary also due to fluctuations in currency exchange rates. The human and social ‘return on investment’ surely is positive. Thus far (today), some of the Kiva statistics are: $125, 340,035 is the total value of all loans made, of which 98,48% is the current repayment rate, and the number of entrepreneurs that have received a loan is 316,314 of which 82,32% are women, and the average loan is $397.62. Lenders come from 194 countries and there are 53 countries where Kiva’s field partners operate. The business proposals presented on the website are accompanied by a brief background of the entrepreneurs, a photo, and what they want to use the funds for. Those aims range from agriculture (e.g., to buy two cows and sell the milk), to groceries (e.g., extending the well-running shop, spare parts for a car to increase house deliveries), clothing (e.g., to buy more and better equipment to make them), and much more. The projects are located primarily in Asia, Africa, or Central- and South America, and a large majority of the entrepreneurs are women. The website also has a blog and email updates where they put short updates about ongoing projects. Although this concept of Kiva probably will not beat the most profitable industries on the Internet, it at least tries to put the networking to constructive use, and it likely will do so even more when the site will be available in more languages and entrepreneurial projects of more countries will be available. Though with such an increase, the currently reasonable search function will have to be improved upon so as to keep finding information quickly. Overall, perhaps it may become an example of the ‘Internet for peace’. P.S. : True, the Kiva approach is not without baggage, and it surely is not, nor should it be, the only means to narrow the disparities in living circumstances between the entrepreneurs and (potential) lenders, but, in my opinion, it deserved the benefit of the doubt. So, yes, I did give it a try. At the moment I write this, with my and 112 other lends, a clothing sales person in Honduras, teachers in Sierra Leone, and a seamstress in Nigeria have the opportunity to realize their ideas to have a more fulfilling life and improve their lot, and I wish them all the best with it. It is not ‘we’, who are relatively rich, who tell them what to do, but the entrepreneurs themselves who decide how to make the best use of the money, which hopefully is empowering. As isolated projects, this may seem insignificant in ‘the big picture’, but it is significant for the people involved and many little bits do amount to a lot. Over the course of the 4,5 days packed together at the beautiful and pleasant ambience of Schloss Dagstul, the fourth Environment Ontology workshop has been productive, and a properly referenceable paper outlining details and decisions will follow. Here I will limit myself to mentioning some of the outcomes and issues that passed the revue. After presentations by all attendees, a long list of discussion themes was drawn up, which we managed to discuss and agree upon to a large extent. The preliminary notes and keywords are jotted down and put on the EnvO wiki dedicated to the workshop. Focussing first on the content topics, which took up the lion’s share of the workshop’s time, significant advances have been made in two main areas. First, we have sorted out the Food branch in the ontology, which has been moved as Food product under Environmental material and then Anthropogenic environmental material, and the kind and order of differentia have been settled, using food source and processing method as the major axes. Second, the Biome branch will be refined in two directions, regarding (i) the ecosystems at different scales and the removal of the species-centred notion of habitat to reflect better the notion of environment and (ii) work toward inclusion of the aspect of n-dimensional hypervolume of an environment (both the conditions / parameters / variables and the characterization of a particular type of environment using such conditions, analogous to the hypervolumes of an ecological niche so that EnvO can be used better for annotation and analysis of environmental data). Other content-related topics concerned GPS coordinates, hydrographic features, and the commitment to BFO and the RO for top-level categories and relations. You can browse through the preliminary changes in the envo-edit version of the ontology, which is a working version that changes daily (i.e., not an officially released one). There was some discussion—insufficient, I think—and recurring comments and suggestions on how to represent the knowledge in the ontology and, with that, the ontology language and modelling guidelines. Some favour bare single-inheritance trees for appealing philosophical motivations. The first problematic case, however, was brought forward by David Mark, who had compelling arguments for multiple inheritance with his example of how to represent Wadi, and soon more followed with terms such as Smoked sausage (having as parents the source and processing method) and many more in the food branch. Some others preferred lattices or a more common knowledge representation language—both are ways to handle more neatly the properties/qualities with respect to the usage of properties and the property inheritance by sub-universals from its parent. Currently, the EnvO is represented in OBO and modelling the knowledge does not follow the KR approach of declaring properties of some universal (/concept/class) and availing of property inheritance, so that one ends up having to make multiple trees and then adding ‘cross-products’ between the trees. Hence, and using intuitive labels merely for human readability here, Smoked sausage either will have two parents, amounting to—in the end where the branching started— (which is ontologically incorrect because a smoked sausage is not way of processing) or, if done with a ‘cross-product’ and a new relation ( ), then the resulting computation will have something alike instead of having declared directly in the ontology proper, say, . The latter option has the advantages that it makes it easier to add, say, Fermented smoked sausage or Cooked smoked sausage as a sausage that has the two properties of being [fermented/cooked] and being smoked, and that one can avail of automated reasoners to classify the taxonomy. Either way, the details are being worked on. The ontology language and the choice for one or the other—whichever it may be—ought not to get in the way of developing an ontology, but, generally, it does so both regarding underlying commitment that the language adheres to and any implicit or explicit workaround in the modelling stage that to some extent make up for a language’s limitations. 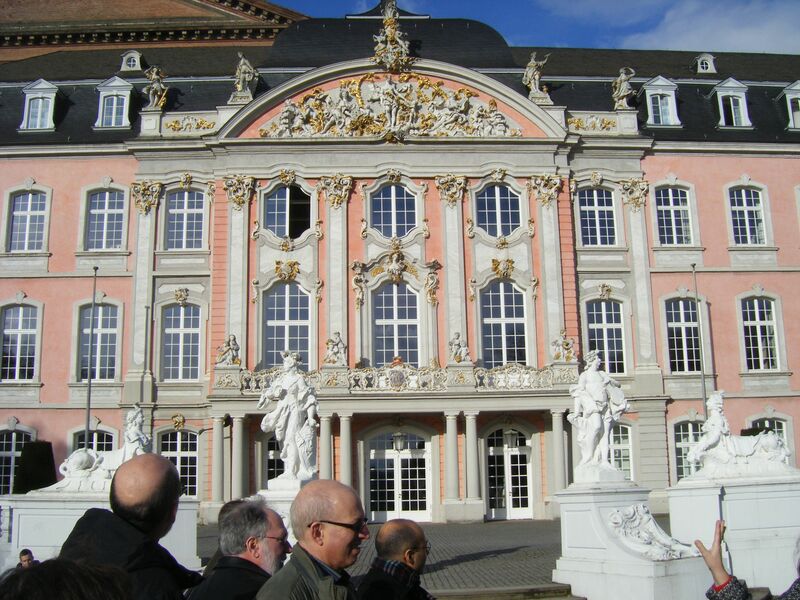 On a lighter note, we had an excursion to Trier together with the cognitive robotics people (from a parallel seminar at Dagstuhl) on Wednesday afternoon. 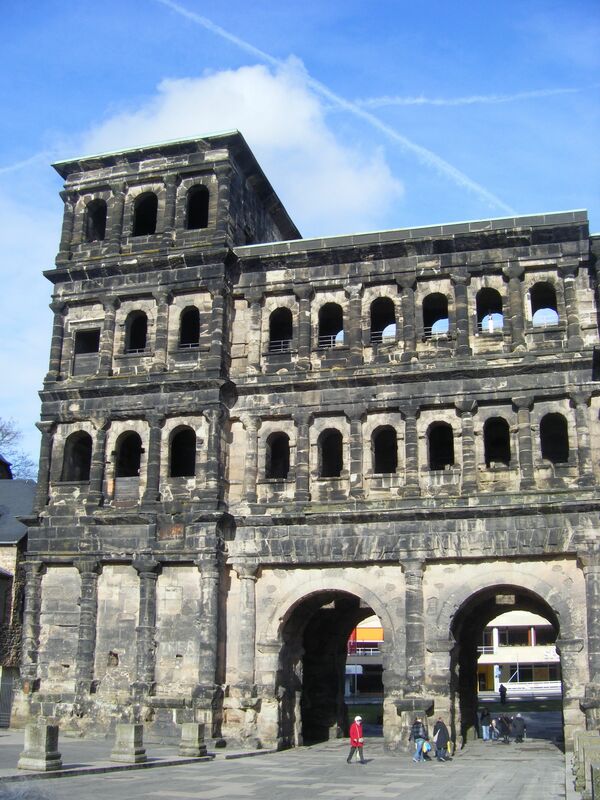 Starting from the UNESCO’s world heritage monument Porta Nigra and the nearby birthplace of Karl Marx, we had a guided tour through the city centre with its mixture of architectural styles and rich history, which was even more pleasant with the spring-like weather. Afterwards, we went to relax at the wine tasting event at a nearby winery, where the owners provided information about the 6 different Rieslings we tried.